The story of the OK Corral is one I know by name only; I haven’t even seen the Doctor Who serial about it. I shan’t be doing a comparison of this to the numerous other cinematic retellings then, though such ground was already superbly covered a couple of years back at Riding the High Country (for a belated entry and full set of links, look here; the piece on Tombstone is here). Not knowing more than the name, and a few key players, I fully expected the gunfight at said corral to be the story’s climax. Maybe it is in other versions, but here it comes about halfway through. It’s the pivot around which the story turns, however, with the first half building to it and the second handling its consequences. It may not be the climax, but it’s still the key incident. Much of the film is driven by its characters, I felt, more so than the fights or plots that they embroil themselves in; though it’s still suitably enlivened by action, both dramatic and violent. It’s populated by a helluva cast — lots of recognisable faces, even if some weren’t yet names at the time. Val Kilmer is undoubtedly the stand-out. He starts off by giving a deliciously camp performance, but unveils layers as Doc Holliday’s story unfolds. Other notable performances come from lead Kurt Russell and villain Michael Biehn, though the latter is slightly shortchanged by having to share villain duties with an unremarkable Powers Boothe. That may be down to historical accuracy. There’s a distinct feeling of veracity to proceedings, and as I understand it a concerted effort was made in that regard. The Movies perhaps shouldn’t worry about sticking too closely to fact (if you want an accurate lesson, read a textbook), but when they can manage to be both factually accurate and entertaining, it’s all the better. Cosmatos & co appear to balance this well. Tombstone was released after the revisionist Unforgiven, but it doesn’t feel like it. Somehow it’s more traditional, almost like it was made in the ’70s or ’80s — not to the extent of portraying a simplistic “white hats good, black hats bad” mentality of earlier eras, but with less of the ’90s gloss or awareness that might be perceived, through contrast, in Eastwood’s Oscar-winner. Not that there’s anything wrong with that — I liked it very much. This review is part of the 100 Films Advent Calendar 2012. Read more here. This entry was posted in 1990s, 2012, 4 stars, Drama, Historical, true stories, Western by badblokebob. Bookmark the permalink. Firstly, thanks for backlinks – I appreciate it. I’m not sure that so-called revisionist westerns were/are really any more or less simplistic than the traditional variety. It could even be argued that in their efforts to dismantle the myths of the west the revisionists actually end up simplifying things even more. Anyway, I know what you mean about this movie – there’s not a whole lot of ambiguity and it does have a glossy look and feel. It’s still a good one though. I don’t know that I’ve actually seen many revisionist Westerns, but to tackle Unforgiven specifically, on reflection I see your point. From memory (I’ve not watched it for a very long time), I suppose Eastwood makes it obvious that he’s aiming to take a different look at the legend of the West, primarily through English Bob so obviously constructing his own story, which can make one assume he is without necessarily giving thought to if he actually is. I don’t recall much doubt over which characters are good and which bad, for instance. And it’s not as if it took til the ’90s to bring an extra level of realism to gunfights, or sew moral doubt in the heroes’ minds, which I believe were other points emphasised to me when I studied it in a film class. Thinking on it, we did a whole module on just the Western, which at 16 or so was actually the first time I’d watched the genre (unless you count Back to the Future Part III, anyway! ), so my experience of Unforgiven‘s position as revisionist was through the filter of Stagecoach, The Good, the Bad and the Ugly, and not much more beyond what we were told. I think writing this comment has made me realise that, having seen a few more down the years, I now really ought to revisit Unforgiven! This may sound heretical but, although there’s much to admire in Unforgiven, I’m not convinced it actually constitutes Eastwood’s best work in the genre. Regarding revisionist westerns, there is, to my mind anyway, a good deal of overrated work in that particular sub-genre. However, if you search around there’s excellent stuff too; I highly recommend Aldrich’s Ulzana’s Raid. Actually, the predominance of the myth in the classic western is something of a myth in itself. Also, the notion that spaghettis, with the exception of Leone, are somehow superior in terms of realism isn’t really sustainable. There’s arguably more artifice and stylized reimagining in the spaghettis than there is in the classic variety. OK, I’m coming at this from the position of someone who’s a huge western fan but I’ve yet to see much that can compare to the very best that Hollywood turned out in the 50s; there’s a thoughtfulness and an exploration of so many varied themes in the better films of that period that remains unsurpassed. I seem to remember that, after I first watched Leone’s Westerns, I found it somehow difficult to imagining watching any others. It’s something to do with his particular style — which, as you said, is not especially realistic at all, but is very striking. 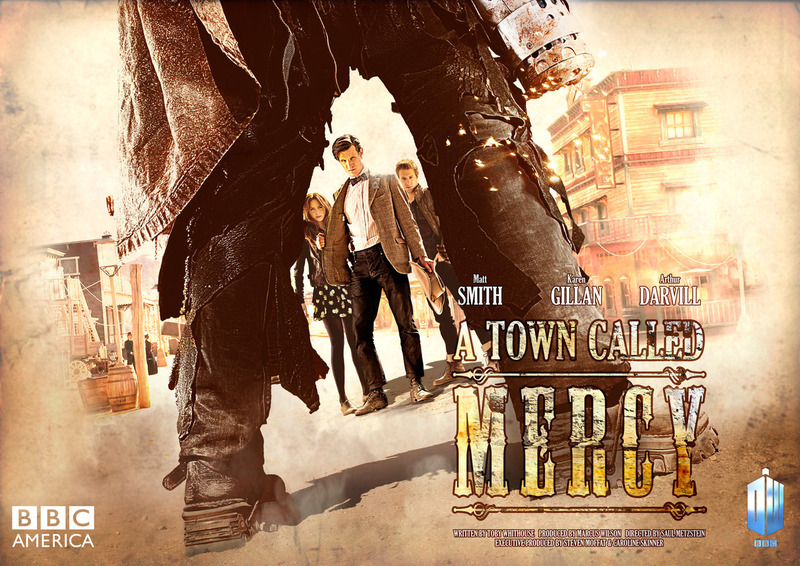 And it’s become so ingrained with the popular idea of what a Western movie looks like — ask someone to make a Western pastiche and it’s going to be all close ups of eyes, stand-offs through legs, Morricone-esque music… See the recent Doctor Who Western episode for a case in point, even down to its poster (link). Of course, I’ve watched a decent number of Westerns since, and it isn’t a barrier at all. I wonder if Clint’s films as director may function as some sort of possible ‘transition’, as it were — he clearly learnt a lot from Leone, but also from other directors he worked with. Don’t know if that theory stands up in practice, but for someone who likes Leone’s work but isn’t sure about Hollywood Westerns, there are worse places to start. Eastwood’s westerns as director certainly draw on his experiences working with Leone, he openly acknowledges the fact, but they also blend in the traditional elements too. If you’re interested in the development of the genre then I recommend you check out Jim Kitses’ Horizons West – he makes a strong case for the evolution of the western from Ford right up to Eastwood rather than a mysterious revolution.